Reading boss Brian McDermott believes Burnley win go on to win promotion to the Premier League. The Royals held the Clarets to a goal-less draw at the Madejski Stadium on Saturday. 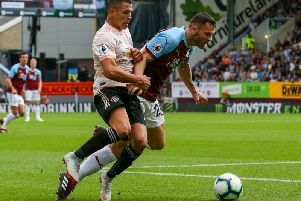 The headline incident surrounded the decision around the hour mark to award Burnley a penalty, after Ali Al-Habsi came out of his goal to challenge Burnley striker Andre Gray, with the Oman international making a save from the spot. McDermott was happy with his side’s display against promition hopefuls, and said: “We are inching towards where we need to go. “We’ve got a couple of clean sheets now at the Madejski. “We need to turn around what’s been happening over the last two years or whatever and get results. “We’ve got a result against a team I think will be in the Premier League next year. “They’ve got Andre Gray and the two wingers – they’ve got good balance to their team and they’re tough to play against. “They turned us around, especially earlier on in the game. “We knew that’s what they would do, and that’s their formula. “They have a formula for success in this division and I think they will be successful. “It’s another clean sheet for us against the top scorers in this division, so we’re pleased with that and it gives us something to build on. On the penalty, McDermott admitted: “It’s very difficult to see. “I’ve looked at it three or four times and it looks like he didn’t touch him. “They don’t think it was a penalty. They say he didn’t touch him, but he made the save for the penalty so as far as we’re concerned that was great news for us.